I started off with a lace sweatshirt that is girly and comfortable. I added the black pieces such as the leggings and boots, but I specifically chose a leather jacket to make the outfit appear edgy. I love the juxtaposition of lace with leather because tough pieces balance out delicate ones. For the final touches, I took a pair of gray over the knee socks (worn here) that matched my top and scrunched them down. Finally, a statement necklace helped pull the look together where the delicate pieces stick out nicely even when placed next to the harsh ones. What is your go-to outfit for Winter? 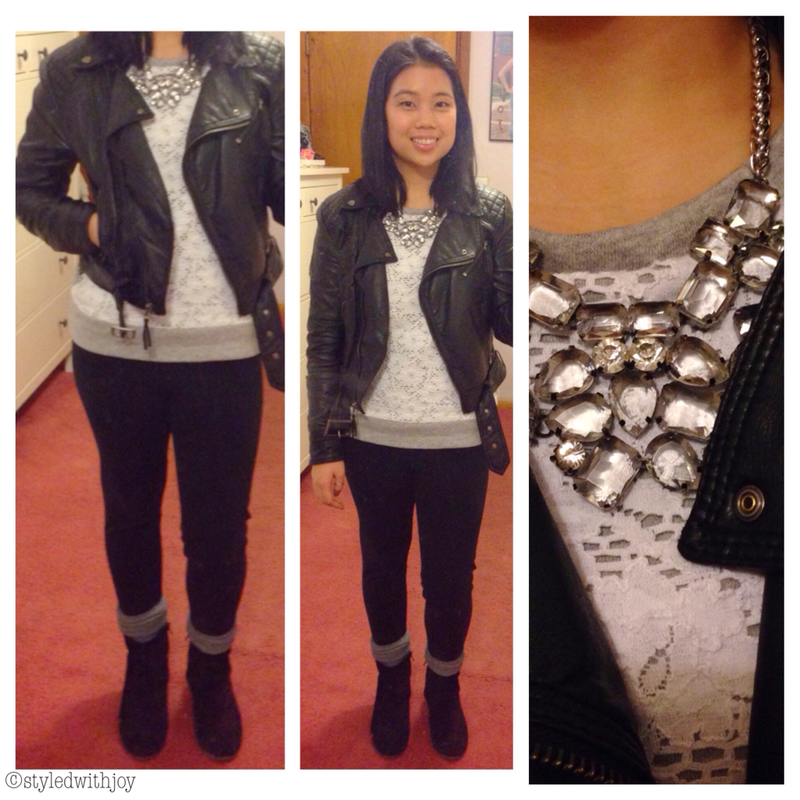 I love that necklace – and the girly mixed with biker chic looks great! I usually wear jeans and a zip hoody, I’m not stylish at all when I want to be warm and comfy lol. Love it! Especially the necklace! Thank you! It’s my favorite statement necklace. Great look! I love that necklace with the whole ensemble. Thank you, Laurel! I love it!